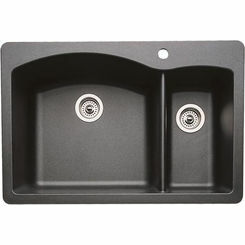 Size : 27" x 22"
The beauty of dual mount kitchen sinks is that they can be installed as a top mount or undermount. This versatility is especially handy for contractors. 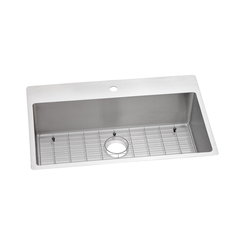 For kitchen renovations and projects, this type of sink offers a flexible solution. 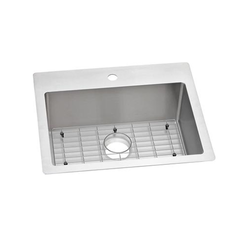 Dual-mount sinks feature an ultra-flat rim which makes it easy to attach to the bottom of solid surface countertops or to drop in a tile or laminate counters. 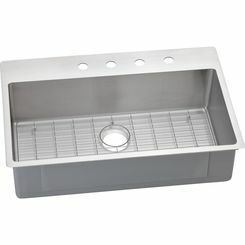 Also, the low-profile rim makes cleanup so easy as it allows you to wipe from the counter directly into the sink.  We carry the best names in the industry at PlumbersStock, and it's no different here. Elkay is a great option because they offer a lot of bang for your buck. 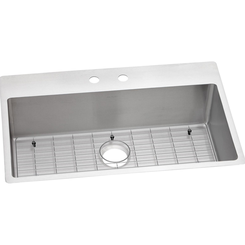 Get a quality, dual mount kitchen sink with the online leaders in plumbing supply. 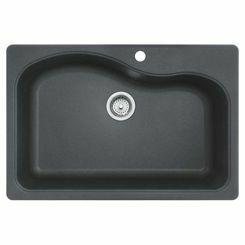 With so many sink options, you might find yourself wondering what color, size, and design will work best to your kitchen. To help you, we provide this guide to help you gain the knowledge you need to make the right decision. 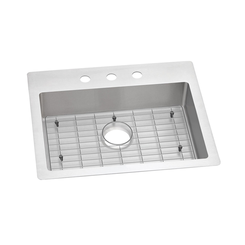 Stainless Steel - if you're hard on your sink or if it's a commercial application, then stainless steel is a great option for you. It is recommended for those who have solid-surface countertops because of its long-term durability and ability to withstand wear and tear. 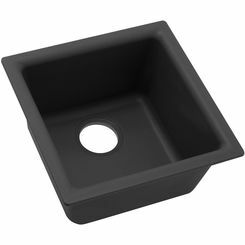 Cast Iron - is specially built to withstand thermal shocks from hot and cold water and vibrations from the garbage disposal. It is heavy but durable. Copper - known to have antimicrobial properties which make it resistant to viruses and bacteria. It is strong enough not give in to rust or tarnish. Composite - has a hard surface with more resistance to heat. Black - brings elegance and doesn't show dirt and stain easily, making your kitchen look good for a long time. 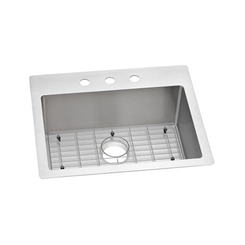 It easily complements most existing kitchen faucets. Stainless Steel - provides a smooth and shiny surface and a timeless look to your sink. 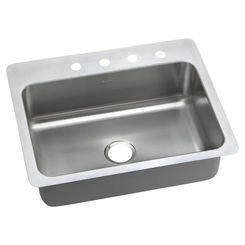 Copper - is sophisticated and good-looking material for sinks. It even makes your kitchen more upbeat and fresh with its deep and enriched color. 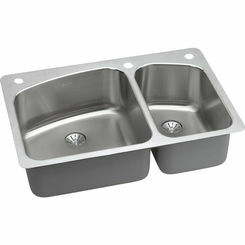 Lustertone - most common in Elkay sinks. It brings a high-quality shine to a sink with a color that blends naturally with light scratches, keeping it looking great as it does on day one. Dual mount kitchen sinks offer different sizes and depths. To help you find the right size, you need to consider the size of the hole in your countertop, the cabinet space underneath, and the depth. 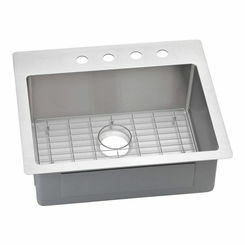 You will want to match the number of holes in your chosen sink to the number of features and accessories you get with your faucet (side spray, air gap, soap dispenser, etc. We also carry plumbing parts and accessories to complete the entire kitchen. Shop now and get the best deals online. 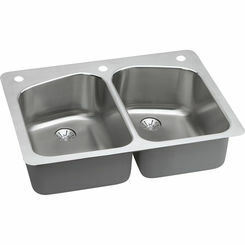 If you decide a dual mount kitchen sink isn't for you, we have every kind of kitchen sink. Consider drop-in or undermount.